MacBook Pro discounts looming, new tech on the way. Rumors around the Apple bonfire predict price cuts for both new and existing MacBooks in 2017 coupled with a refresh that adds support for 32GB RAM and more, dependent on whether Intel launches Cannonlake processors on time which isn’t looking good as they are still slating a 2018 release date as of writing. With the new series of power efficient processors Apple would have the necessary power needed to allow more than 16 GB of RAM that is available in the existing 2016 model. Many customers have been upset that the new MacBooks, which run more energy efficient Skylake processors, continue to max out at 16GB of RAM and cost more than previous-generation models. 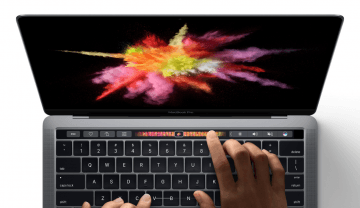 For instance, the entry-level 13-inch MacBook Pro with a Touch Bar starts at $1,799, $500 more than previous-generation models.